ROC grounds its policy agenda in the Food Declaration because we believe that sound public policy should come directly from the voices of the people. The movement to create a healthier food and agriculture policy in the US has been slowly and steadily gaining ground for well over a decade. Those all around the nation who began the work are encouraged by the progress and simultaneously concerned by the pace of change given the disproportionate impact of food and agriculture on personal and planetary health. A clear statement of what kind of policy is needed now, endorsed by a broad base of organizations and individuals with a long-established commitment to a healthier food and agriculture. An invitation to all Americans to join in the improvement effort by taking action in their own lives and communities and by offering them a way to call on policy makers to support comprehensive change. A set of principles from which policy makers can craft policy that will lead to a healthier food system. After the first draft was completed, significant contributions were made by Wendell Berry, poet and author; Judith Bell and Sarah Treuhaft, of Policy Link; Stephen Gliessman, UC Santa Cruz; Alan Hunt, Northeast-Midwest Institute; Vance Russell, formerly with Audubon CA; and Winona LaDuke, Native American Leader. An original framer, Michael Pollan, edited the third draft. Over 200 national food and agriculture leaders immediately endorsed the Declaration. 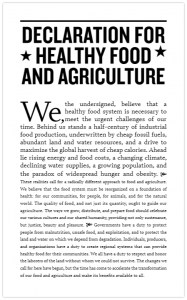 “We, the undersigned, believe that a healthy food system is necessary to meet the urgent challenges of our time. Behind us stands a half-century of industrial food production, underwritten by cheap fossil fuels, abundant land and water resources, and a drive to maximize the global harvest of cheap calories. Ahead lie rising energy and food costs, a changing climate, declining water supplies, a growing population, and the paradox of widespread hunger and obesity. Roots of Change grounds its California and federal policy agendas in the Food Declaration because we believe that sound public policy for the good food movement should come directly from the voices of the people, and not corporate industrial interests. We invite you to learn more about our current and past food systems advocacy.